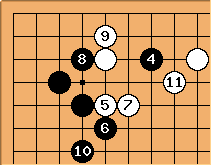 White's low approach and Black's diagonal answer were a key feature of the nineteenth-century Shusaku fuseki. 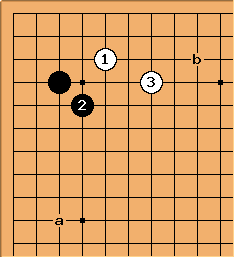 With the advent of komi go a pincer became the common answer instead of the diagonal, because it was considered faster for Black and hence a better way to overcome komi. Recently, the diagonal came into fashion again for both sides. The most common white reply is tenuki. 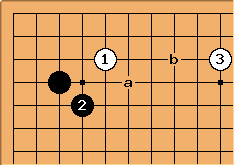 In Edo-period games next here was standard, with White probably responding at a. Later this play went out of fashion: Black can instead play a pincer on the upper side, rather than encourage White to take territory. It is however still played in pro games. Instead of a, White can also reduce the Black influence along the left side. If White a Black will himself extend from his influence if possible. See also: Basic Instinct in Joseki 1. If White does respond here, the light extension to is a common choice. White's plan is Black a, White b if the invasion comes. 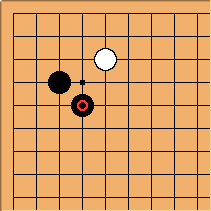 In response to Black c, White d then makes an ideal extension. 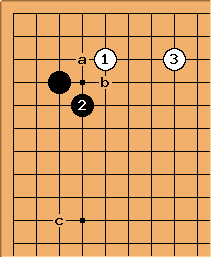 Another common choice is here, which is reasonable both from the point of view of taking up position on the upper side, and matching Black's influence. Black will either finish the joseki with a or start a fight with b. Extending only two spaces to here seems to go against conventional wisdom: after Black a White b, is too close to the two-stone wall. But in terms of the overall position this choice of is played in pro games, in order to establish a solid group: and Black often holds back from playing a preferring to play c; tenuki is not joseki. This is a classical play, that isn't really part of the modern style except in special cases. Black would continue with a or b. This reply exemplifies the relationship between keima and kosumi. 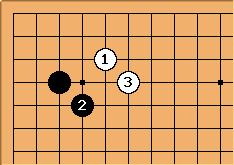 This long time discarded joseki is known as aigosumi joseki and can still occasionally be seen.